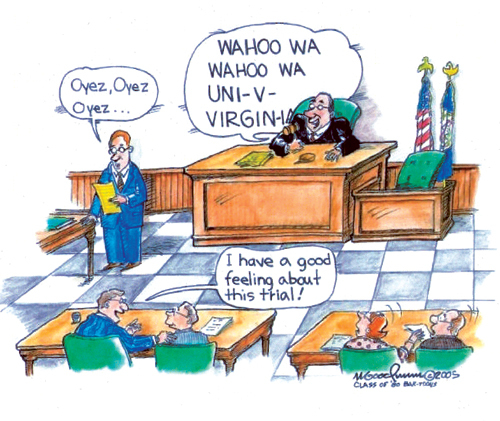 Before his cartoons with legal one-liners appeared in books and major newspapers, readers were exposed to his cheeky takes on conservative professors, clueless 1Ls and other aspects of law school life in the back pages of the Virginia Law Weekly. One typical cartoon featured a student begging a professor, de­picted reclining in a hammock, to grade his pre-Christmas exam before May. “I remember getting handwritten notes from professors, usu­ally tongue-in-cheek or kiddingly threatening me,” Goodman said. Though he’s now a partner at the Richmond law firm Goodman Allen Donnelly, Goodman found that cartooning was a calling he could not ignore, even after embarking on a legal career. While clerking for Judge James C. Turk of the U.S. District Court for the Western District of Virginia, Goodman moonlighted. He developed a daily comic strip called “Wingtips,” which followed the antics of a hapless judge — presumably bearing no resemblance whatsoever to Goodman’s new boss. 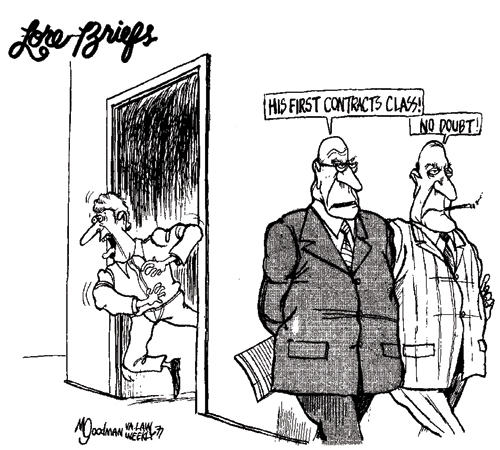 Universal Creators Syndicate acquired “Wingtips” in the summer of 1981. The comic was distributed to newspapers across the country. That was about the same time Goodman got hired for his first law firm job. His goal was to eventually transition to cartooning full-time. After a year of this hectic schedule, Wingtips had only been picked up by 38 newspapers. Goodman had a wife, a child on the way and a mortgage. He felt he had to drop the strip. “I gave up the wrong thing and practiced law,” he joked. Today, he specializes in medical liability and risk management at the 30-lawyer firm he co-founded in 1998. Goodman has drawn for a number of publications over the years. He contributed illustrations to a best-selling satirical take on the legal profession, “The Official Lawyer’s Handbook,” by Daniel R. White. 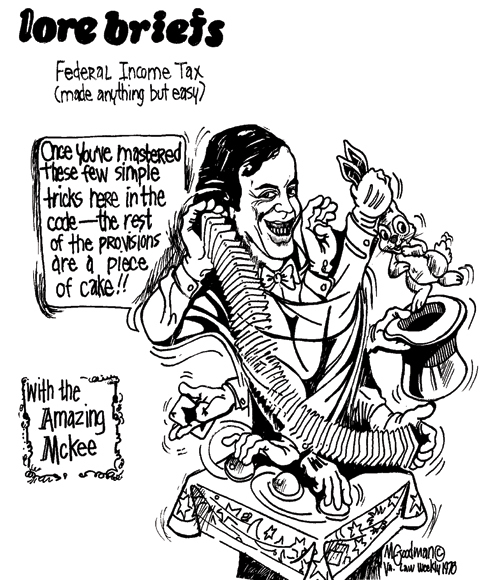 He also cartooned for the Richmond Times-Dispatch Sunday business section for a stint, as well as Virginia Lawyers Weekly and Virginia Business Magazine. Before the Law Weekly, as an undergraduate he contributed to The Cavalier Daily. Goodman said he has been drawing for as long as he can remember. “It’s pretty much all I ever really wanted to do was to be a cartoon­ist,” he said. He now spends spare time painting and sculpting, and has passed his love of art on to his kids. Two of his three children are artists working in New York ad agencies. “So now, I learn from them,” he said. As an adjunct professor at the University of Richmond School of Law, Goodman urges students to hold on to their interests outside of the law. Goodman admits that he has even doodled while witnesses have provided sworn testimony. 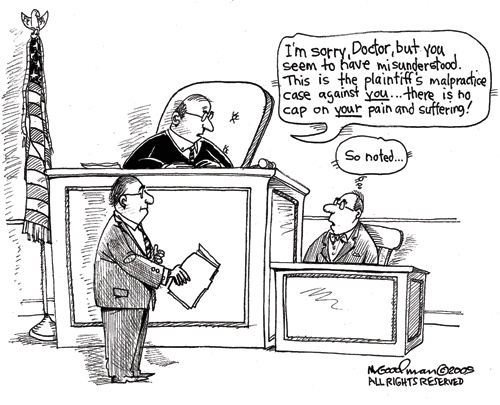 “I drew my way through depositions very often,” he said. Although his output has recently been limited to the firm’s holiday cards, Goodman anticipates that his passion for cartooning will one day gain the upper hand again.